Salman Ahmad: Muslims have expressed their faith, their lives, their hopes, through music, through poetry, for 1,400 years. 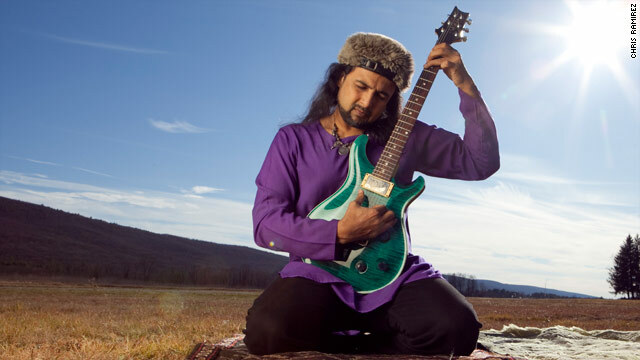 (CNN) -- Salman Ahmad is a devout Pakistani Muslim on jihad -- but his holy war is a rock 'n' roll battle against intolerance, he says. He's the frontman of the band Junoon. He's sold 30 million albums. And he says music is a powerful weapon against extremism. "My own personal narrative tells me that arts and culture is mightier than the sword," he told CNN during a tour of the United Kingdom Thursday. Ahmad, who was born in Pakistan and grew up in New York, has set himself an ambitious goal -- not only fighting Muslims' own misconceptions about their religion, but reclaiming the very word "jihad" from extremists. It's come to mean violent holy war of the kind waged by al Qaeda and the Taliban. But Ahmad says that's not its true meaning. "There has been a sinister case of identity theft where the extremists have hijacked not only language but culture," he said. "Jihad means to strive, to overcome your ego, to work for social justice and peace." That may be why his new book and album are called "Rock & Roll Jihad." He insists his long-haired, guitar-driven rock music is entirely compatible with Islam. "Anybody who says that music is un-Islamic is a poser," he said. "Muslims have expressed their faith, their lives, their hopes, through music, through poetry, for 1,400 years." His own music is a fusion of the wildly disparate influences he grew up with, he said. "I was a 13-year-old from Pakistan (when I) arrived in a suburban cocoon like New York," he recalled. "My exposure to rock-and-roll was watching Led Zeppelin in Madison Square Garden." Frontman Jimmy Page "had a two-headed guitar and dragons painted on his pants, and I said: 'That's what I want to do with the rest of my life.'" "My music takes equal inspiration from classic rock like Led Zeppelin and the Beatles and also Sufi poetry," he said, citing a mystical Muslim tradition. "We are in the same tradition of musicians who are sending out a message of love, a message of joy." And while he may seem like a trailblazer -- and be one -- he said he is not alone. South Indian Muslim composer A.R. Rahman won an Academy Award for best song for "Slumdog Millionaire's" anthemic "Jai Ho," Ahmad observed. And Ahmad's mentor, Nusrat Fateh Ali Khan, performed with Peter Gabriel and Pearl Jam's Eddie Vedder. "He said to me, "The Quran promotes cultural diversity, so why not play with rockers?'" Ahmad's done some high-profile collaborations of his own, including recording a song with American rocker Melissa Etheridge. "I saw him perform at the concert and was amazed by his vocal and guitar abilities. Here was this traditional Eastern sound that was rocking hard at the same time," Etheridge writes in the introduction to Ahmad's new book. They traded ideas, resulting in the song "Ring The Bells." She remembers listening to some tunes he recorded to kick off their collaboration: "I found in one track a haunting guitar part that I kept playing over and over until finally the words started to come. 'Whose God is God? Whose light is light? Whose law is wrong? Whose might is right?'" The message is resonating, Ahmad said. He has played rock concerts in the disputed territory of Kashmir, with "thousands of kids braving death threats going to hear concerts," he said. "It's a way for people to vent their emotions. Junoon's sold over 30 million albums," he said. "That music wasn't bought by a fringe. That's a mainstream majority."